Go gorgeous and still go easy on your pockets. Here’s an easy way to get a dazzling look. With increasing age, the hyaluronic acid (HA) content in the skin decreases, reducing its capacity to stay moist and supple. In addition to this, oil producing glands become less active, making the skin dry. Overtime, skin also loses fat and as a result, its youthful glow and smoothness get diminished. At 25 – Visible skin aging begins; old cells in the skin get replaced more slowly. At 30 – More fine lines develop due to a breakdown in collagen and elastin; delicate skin under the eyes begins to thin. At 40 – Deeper lines begin to etch around the mouth and eyes; furrows appear on the forehead, and circles under the eyes may grow into pouches. Skin becomes noticeably drier. At 45+ – The skin becomes thinner, partly because of hormonal changes; it loses much of its strength and elasticity. At 50+ – Age starts to show on your face. Fillers contain HA which is a form of natural sugar that our body produces routinely. HA fillers are the most preferred form of dermal fillers due to their efficacy and safety quotient. Smoothening nasolabial (smile lines) folds for a youthful look. Shaping lips to make them look more luscious and beautiful. Shaping cheeks by making the cheekbones look higher and more chiselled, thus knocking off years from the face. Shaping the nose to make it look more aligned with the rest of your features. Shaping the jaw line for enhanced beauty. Smoothening the skin under the eyes to reduce signs of aging.and reduce dark circles. When injected into the skin layers, it fills up the space and does away with the imperfections of the skin, caused due to aging. Length of procedure – It takes about 15-30 minutes. Effectiveness for atleast a year – There are different fillers available in the market which will give effects of varying duration, but the minimum duration for its effectiveness is between 10 and 12 months. Mid-Face – Tear trough/Nose shaping/Cheek shaping. Lower Face – Nasolabial folds/ lip volumising and reshaping/chin reshaping/mental crease/jaw line shaping. Avoid Aspirin, Ibuprofen and Vitamin E for 3 days before and after the treatment. Take Arnica before and after the procedure. Avoid steam, sauna, heat and any facial treatments for 3 days after the procedure. Call the doctor immediately in case of any discomfort. Bruising and hematoma may occur after the treatment, so do not schedule any social engagement immediately after treatment. Do a follow-up session after 6-8 months. 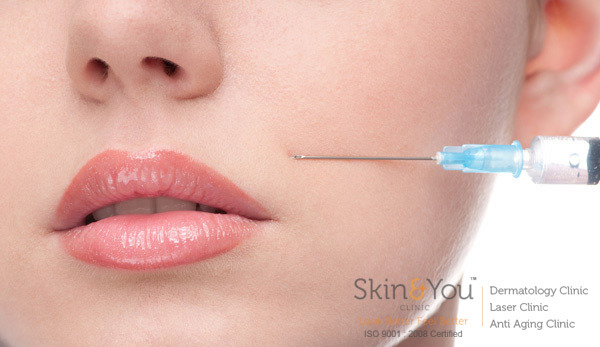 Why Skin & You Clinic for Dermal filler Injections? We at Skin & You Clinic are trained and we understand the importance of facial aesthetics, the need to balance the face propotions and just put the minimum amount of filler needed to enhance your facial features. the procedure is safe simple and effective.